Our system solutions are additional components to the pyrometer which expedient extend the application range. If there are any further questions please do not hesitate to contact us. LED digital display for panel mounting. Regulus RF and RD are specially designed programmable PID controllers for use with a Sensortherm pyrometer and enable intelligent and very fast control processes. They are available in a compact panel-mounting version or a desktop housing for use with two pyrometers and additional relays contacts. Timed heating ramps, holding times and cooling rates are selectively programmable. Intelligent APA (Automatic Process Adaptation) functions improve process control for soldering applications. 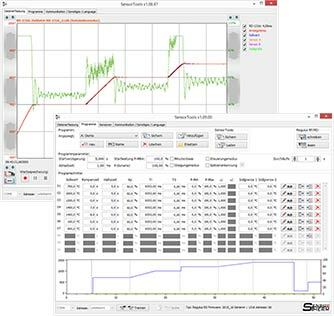 The extensive logging functions of the SensorTools software are ideal for “online” monitoring and for subsequent analysis of the processes. The controller is able to take full advantage in the high requirements of the laser power control. Applications such as laser hardening, laser soldering or laser welding are no problem due to an extremely fast sampling time of only 100 μs. SensorTools for Regulus is the standard software to program the Regulus, then the Regulus completely autonomously executes the programmed control steps. Operation with PC connection additionally allows direct visual control of a running process. The Galaxy line scanner is used for continuous scanning of measurement objects and always detects the temperature on a line. The scanner can be combined with various Metis series pyrometers and is therefore suitable for the measurement of many different materials, depending on the choice of pyrometer. The scanner is equipped with a stepper motor for extremely long service life and continuous 24/7 operation. Angular position and the scanning speed can be adjusted. 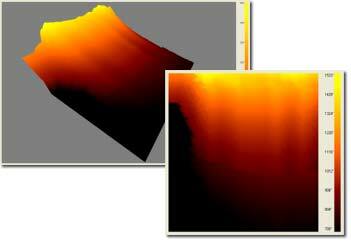 In addition, up to 4 individual scanning areas can be defined for separate analysis. The step speed is adjustable between 1 and 4000 steps per second. The scan angle is split into 1600 single high-resolution steps: Models SC11 / SC12 between 3.6 and 90°, and Models SC31 / SC32 from 0.6 to 15°. SC12 / SC32: Additional with four analog 0/4-20 mA outputs, digital display and pushbuttons to configure the system without computer. Using the cooling housing KG23, the Galaxy can use even under harsh conditions. An SC10 scanner is primarily used to detect the maximum temperature of objects, where at fixed aligned pyrometers the measuring object would move out of focus or cold parts of surfaces (e.g. scale) does not display the required measurement result. The system is optimally adapted to the application conditions in the steel industry. The optics system is designed for up to 250°C, the purge air provides additional cooling and keeps the optics tube and thus the pyrometer field of vision free from contamination. The electronics of the measuring system is mounted in up to 30 meters in a protected position. In this application it is measured by the pyrometer from below of the strip, so that the measurement result is not affected by scale or water puddles on the strip. The evaluation unit is remotely installed in the control cabinet. The measuring tube is kept free from contaminants with flush air. The AZ76 measures the temperatures of passing measuring objects with a pyrometer and determines their maximum temperature. These values the AZ76 compares with a predetermined temperature range and output a corresponding control signal (via 4 switching outputs for the states overheated, too warm, good or too low) if temperatures are in accordance or deviation. Each measured value with valuation result, date and time is stored in the device (max. 32000 records). Data can be read out via interface commands or via the external software SchmiedeWin. 4 signal inputs can be used to transmit switching signals to the AZ76 of successfully changed switching gates to the correct position, and save in the log.